Nancy Pelosi’s problem inside the Democratic caucus isn’t going away – as a new generation of lawmakers starts to openly question her leadership in the wake of consecutive special election losses. But inside the rank-and-file, members are getting restless and the call for Pelosi to depart is louder than ever. Therein lies the rub. Pelosi has been in charge of the caucus since 2003, and the current leadership team has been at her side for years. That team includes Pelosi, D-Calif., 77; Democratic Whip Steny Hoyer, D-Md., 78; and Assistant Democratic Leader Jim Clyburn, D-S.C., 76. If Pelosi were to step down, it’s unclear who would fill the void and whether either of her top two deputies would be the right fit. House Democrats also have not elevated younger lawmakers into top leadership positions the way House Republicans have. “The problem is that you can’t replace somebody with nobody,” said one senior Democrat close to Pelosi. While Hoyer may be the natural successor, there are other options – like House Democratic Caucus Chairman Joe Crowley, D-N.Y.; Vice Caucus Chairwoman Linda Sanchez, D-Calif.; and Congressional Black Caucus Chairman Cedric Richmond, D-La. None of those lawmakers, though, represents the kind of blue-collar Midwestern districts that helped turn the 2016 election for President Trump. But the rank-and-file clamor to explore new leadership options is real, especially after Republican Karen Handel’s victory in this week’s Georgia House special election. Fox News has learned that Reps. Kathleen Rice, D-N.Y.; Seth Moulton, D-Mass. ; and Tim Ryan, D-Ohio, called a meeting Thursday of Democrats interested in exploring other options besides Pelosi. Rice and Moulton wouldn’t comment on who was there or how many lawmakers attended. Fox News has confirmed about a dozen members attended. “They had geographic, ethnic and political diversity there,” one source familiar with the conclave said. Moulton indicated Thursday that he’s “not running.” Apparently neither is Rice. In some respects, the loss in Georgia merely underscored the reservations more junior members have with Pelosi. “Given the drumbeat of loss after loss after loss after loss, the drumbeat is much louder,” Rice said. Rice said she and Moulton won’t try to stage a coup. That nearly happened to then-House Speaker Newt Gingrich when a group of Republicans came close to shoving him out the door in the summer of 1998. But it was clear that Gingrich’s days were numbered at that point. “We’re not going to do something in secret away from the caucus,” Rice said. Some Democrats close to Pelosi indicate she may have to make a choice over the next year: stick around with the hope that Democrats win back the House, returning her to the speaker’s suite, or decide to leave earlier to give Democrats a better chance to win the House and pass the baton to someone else. 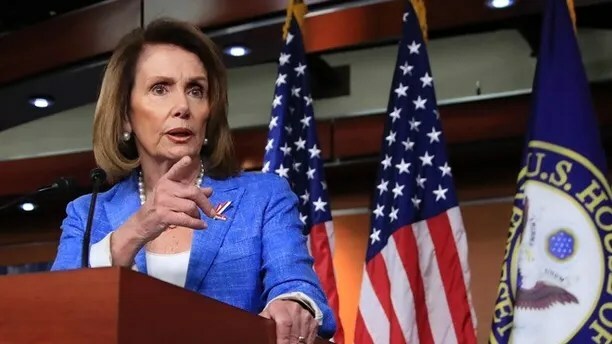 One source close to Pelosi told Fox News she will not do anything to harm the caucus and regularly evaluates those dynamics. Late last fall, Pelosi faced an internal challenge from Rep. Ryan and prevailed with two-thirds support in her caucus. Republicans are openly rooting for Pelosi to stay, under the assumption that her presence helps GOP candidates. If there were to be an effort to challenge Pelosi, it likely would come inside the House Democratic Caucus, as opposed to on the floor.